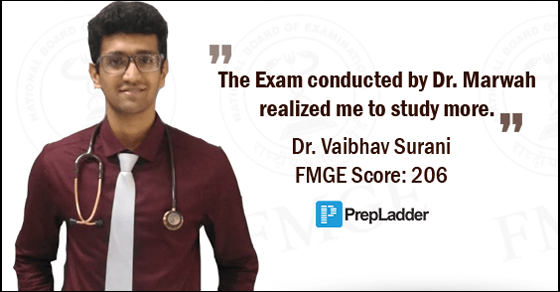 Prepladder congratulates Dr. Vaibhav Surani on clearing FMGE June 2018 exam. We wish him all the very best for his career and future ahead. I am Dr. Vaibhav Surani. I did graduation from Davao Medical School Foundation, Philippines. I scored 206 marks on FMGE June 2018. According to you what is the correct approach to study for FMGE? Only MCQs or Theory + MCQs? Both theory and Mcqs are required to be prepared for successfully clearing FMGE. FMGE solutions by the great Dr. Marwah and Dr. Siraj Ahmed + all the subject wise class notes of DIAMS. Nothing more than this. Is this your first attempt? If No, what did you do different this year that lead to your success? It was my 1st attempt. Revision is the most imp thing, the last 1 and a half month should be kept only for revision, we should not try to study anything new. Yes, the Pre FMGE mock conducted by Dr. Marwah was very very challenging, I just scored 159 and 163 marks. The exam was of a kind that opened my eyes and made me realize that I need to study more. Yes, for the last 2 months I had a timetable for revision. I was an average student all through my graduation. We thank Dr. Vaibhav Surani for sharing his success story.